Discover the fastest, easiest way to add “native” COM ports to your server via your Local Area Network. When you need to add a large number of data communication ports to your server, Serial Hubs and DeviceMaster hubs provide the ideal solution. These ports can reside outside your server anywhere on your LAN, keeping your server in a secure back-office location while your ports conveniently reside on the work floor. 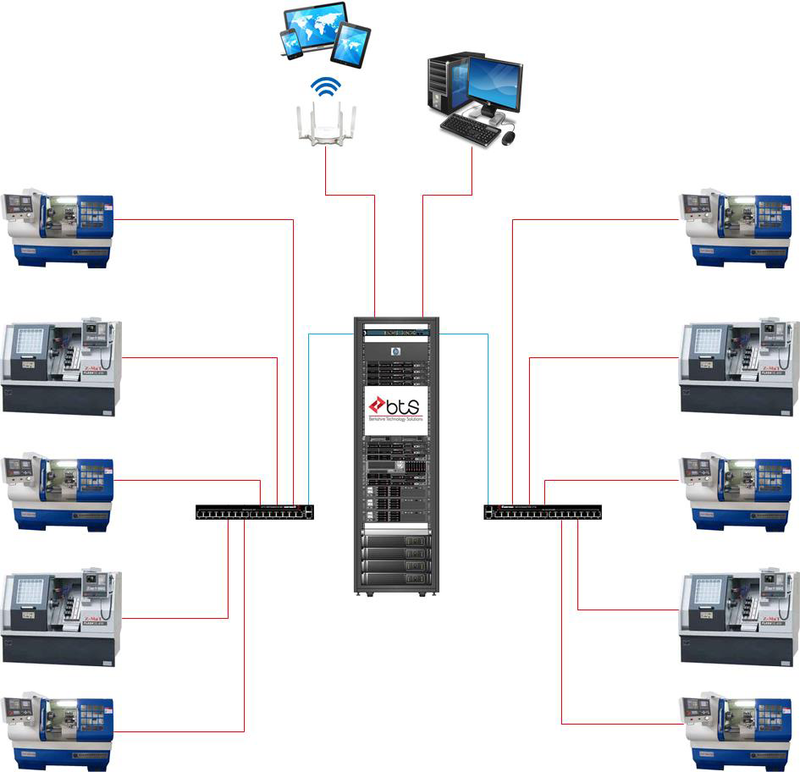 BTS DNC Professional™ Software provides centralized management and downloading of Numerical Control (NC) programs. It includes configurable security, open network capability, document management, an available wireless option and more. BTS DNC Software can control one work center, or your entire shop floor, to put you on the path to paperless manufacturing. The wireless units on each machine convert the incoming NC programs from Ethernet data into RS232 signals for input into the CNC’s serial communications port. The DNC server includes a software application that assigns a specific IP address for each of the communications ports. This function eliminates the need for a separate serial port server and enables the system to transmit data to the correct RS232 converting device. The BTS DNC Professional™ Communicator module can run on a file server as a service. The Communicator waits for a command to send or receive a file, either from a CNC control or from one of the PC’s, using the “controller” module of the BTS DNC Software. The CNC machines would be hardwired using RS232 or shielded CAT 5 cable from the serial port on the CNC control to the location of the multiport hub. Machine operators could send and receive files direct from the CNC controls or from any of the PC’s on the company LAN. Copyright © 2017 Berkshire Technology Solutions. All rights reserved.